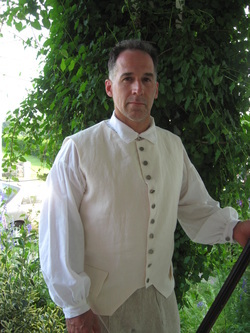 Waistcoats come in many different styles and lengths. The period you are depicting will dicate what you wear. All waistcoats are available in linen, canvas and wool. There are also fancier fabrics such as brocades and silks for the civilian portrayer. All linen and cotton fabrics are preshrunk before cutting. Button choices include: pewter, wood, fabric covered, gold or silver. We have standard waistcoats or we can design one to your specifications.